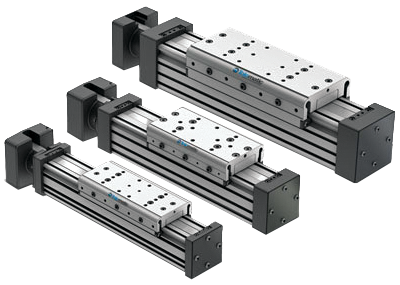 HTE’s extensive offering of linear motion systems includes parallel and angular grippers, motorized electric linear slides, linear servo actuators, electric rod-style actuators, linear motors, and much more. The ability to adapt to multiple control platforms, these industry-leading linear slide products are an ideal solution for all applications. HTE Automation distributes actuator systems and components from top manufacturers like Intelligent Actuator Inc (IAI), Accutech, Epson, and Tolomatic. Backed by these industry-leading companies, HTE has electric linear actuator solutions for applications ranging from semiconductor fabrication to high-intensity factory automation. Our extensive selection means we have an ideal product for all industries and processes. When looking for an actuator solution HTE Automation has the product to fit your application if you are located in Kansas, Missouri or Illinois.